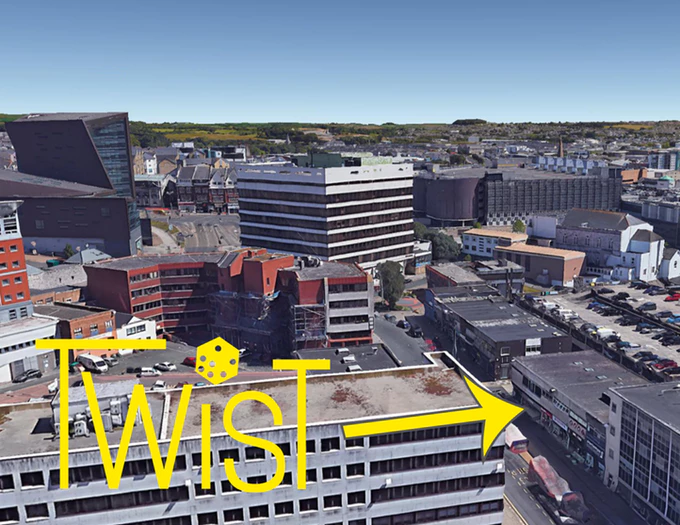 Hi, I'm Hayley, and welcome to the crowdfunding campaign for Twist - Plymouth's first board game cafe. We've got a target of £6,000 and 28 days to raise it... let's go! 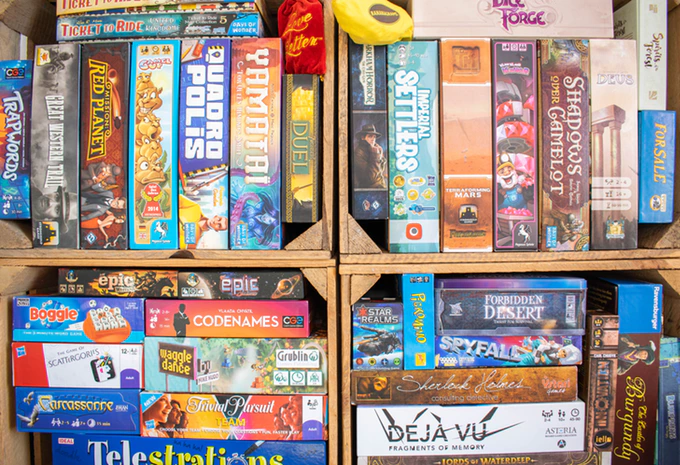 What exactly is a board game cafe? So much more than a cafe! In Tripadvisor terms a board game cafe would be a "Thing To Do", something a little different from the cinema or all the usual suspects. It's the perfect place to spend an evening with friends - eating, drinking and of course, playing board games! 1. TURN UP, let us get you seated and get comfy. It's waiter service so order any food and drinks you want directly to your table. 2. EXPLORE the games library, pick an old classic or find a new favourite. A Game Guru will be on hand to provide tailored recommendations. 3. PLAY! Your Game Guru can explain rules and get you started straight away, they'll be around for anything else you need during your visit. You've got full and unlimited access to the library, so play as many games as you like whilst you're here. Most of the time you'll be able to stay as long as you like and play as many games as you like. At busy times there will be a 4-hour limit. The games sessions charge will go towards buying new games, maintaining the games and replacing damaged games or lost pieces. It also contributes to the cost of our Games Gurus who are always on hand to recommend and teach games. Memberships are personal and benefits apply to the member only. Games session tokens can be used by anyone. We're taking over an empty shop on Mayflower Street - right in the city centre! The ground floor will seat about 32 people and will open first. Once downstairs is up and running, we'll refurbish the first floor to give us an additional versatile space for events and another 50 seats. All of the boring stuff is covered, we just need funds for games! Successfully funding will mean we can launch with a library of over 300 games. It is possible to start a board game cafe with fewer games, but we want Twist to have the wow factor from day one. With 300 games available everyone will have plenty to choose from. You can find our wish list of games here. If there's anything you're keen to see added then please get in touch. The more we raise, the more games we can have! 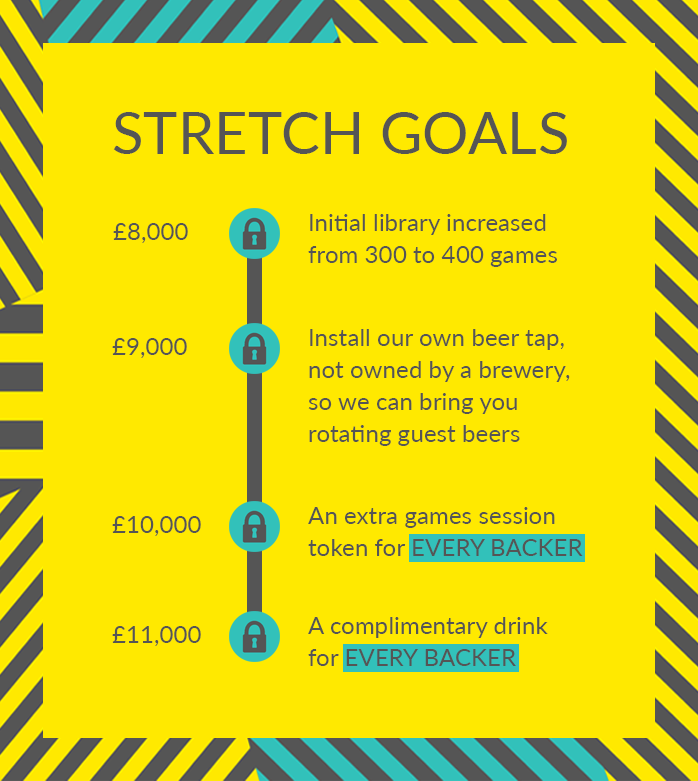 Every backer will have the opportunity to suggest games for the library. There’s a book I love called Steal Like An Artist by Austin Kleon. In it he suggests you “write the book you want to read” - so armed with the desire for a board game cafe in Plymouth, 14 years of experience in the catering industry and Austin's wise words I decided to "write my book". Twist is my dream hangout – chilling with friends, board games, tasty homemade food and quality drinks. A year's membership, starting from the day we open. 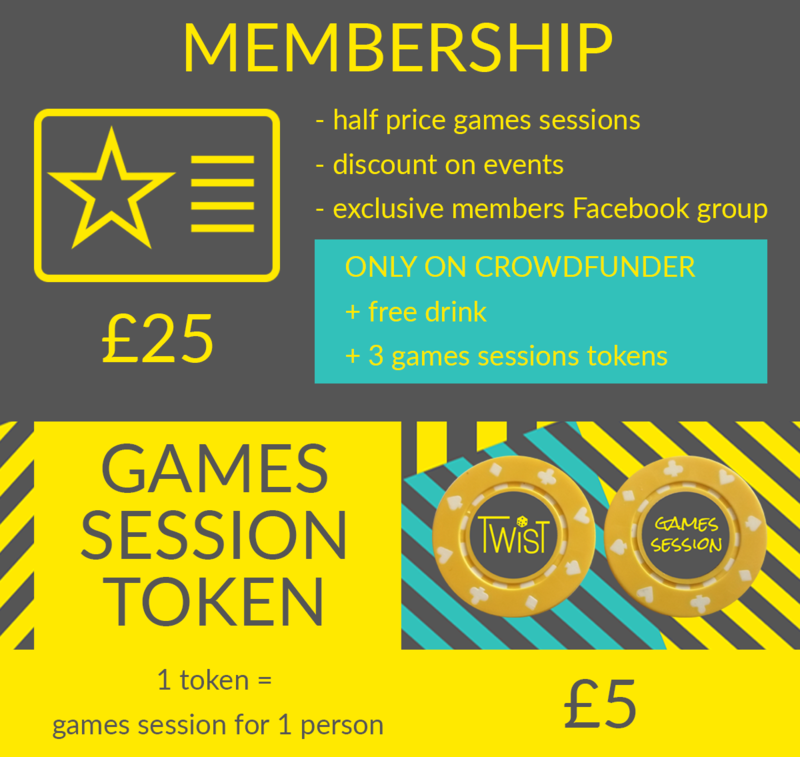 Entitles you to half-price games sessions and more! Pick any game in the library and we'll put a certificate in the lid letting everyone know you supported us! You can dedicate it to any person, animal, place or thing you'd like! So pop yourself in Yahtzee, a mate in Monopoly, your company in Cluedo or your dog in Dominion. This pledge is to sponsor a game only. To get membership too, just add the relevant membership amount to your pledge. If you'd like us to source a particular game for you to sponsor then please get in touch. 1 ticket for our launch night, plus a drink on arrival and a souvenir to take away (choose from Twist tote bag, coffee cup or t shirt). Includes a year's membership, starting from the day we open. Entitles you to half-price games sessions and more! BE IMMORTALISED IN TABLE FORM! This pledge is to sponsor a table only. To get membership too, just add the relevant membership amount to your pledge. 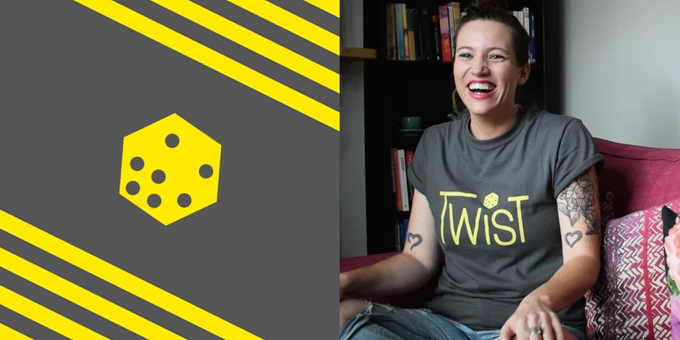 A Crowdfunder exclusive - be one of the founding members of Twist. Includes your first year's membership, plus half-price membership renewals for life.  Get an exclusive founding member card, available only from this crowdfunding campaign, cards will be numbered, the first founding member will get number 001, the second 002 and so on. Specific numbers available on request. On your first visit you'll get any main, drink and snack and a game to take away (RRP £10-15, there will be a choice). You'll get all the Twist gear - cotton tote bag, t shirt, coffee cup, badge. Get an exclusive tour around Twist before we open. You and up to three friends can join us for an evening - taste the menu, challenge us to some games and be the first people to drink either a) beers, or b) cocktails at Twist. We'll make sure a favourite of yours ends up on the menu! You'll all also get the £25 membership pledge and a piece of Twist merchandise of your choice to take away. EACH TASTING ONLY AVAILABLE TO ONE BACKER! Creating fun, that’s why we’re here. It doesn’t matter who you are, how old you are or what you do as a job, you need to have fun. When was the last time you played? Life can be stressful and serious and play often gets neglected... but we need it. Play builds relationships, unleashes our creativity and makes us smarter. I would love to hear from you. Chatting to people who are excited about Twist, or who have suggestions and questions is what keeps me sane and focused on the end goal. You can connect with Twist on Facebook, Instagram and Twitter. Pick any game in the library and we'll dedicate that game to you. We'll put a certificate in the lid letting everyone know you supported us! + personalised postcard + project updates. This pledge is to sponsor a game only. To get membership too, just add the relevant membership amount to your pledge. If you'd like us to source a particular game for you to sponsor then please get in touch. 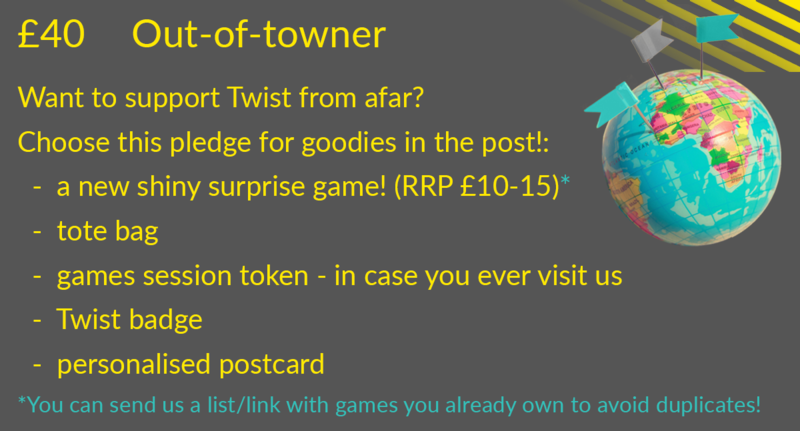 Support Twist from afar: - a brand new shiny surprise game! (RRP £10-15) - tote bag - games session token (in case you ever visit us in Plymouth!) - Twist badge - personalised postcard All posted to you! Includes shipping within the UK, add £5 shipping for rest of world. We'll put an engraved plaque on a table in the cafe, dedicating it to you (or whoever you want!) + personalised postcard + project updates. This pledge is to sponsor a table only. To get membership too, just add the relevant membership amount to your pledge. Get an exclusive tour around Twist before we open. You and up to three friends can join us for an evening - taste the menu, challenge us to some games and be the first people to drink cocktails at Twist. We'll make sure a favourite of yours ends up on the menu. You'll all get the £25 Membership pledge and a piece of Twist merchandise of your choice to take away. ONLY AVAILABLE TO ONE BACKER! Get an exclusive tour around Twist before we open. You and up to three friends can join us for an evening - taste the menu, challenge us to some games and take some of our potential beers for a spin. We'll make sure a favourite of yours ends up in the fridge. You'll all get the £25 Membership pledge and a piece of Twist merchandise of your choice to take away. ONLY AVAILABLE TO ONE BACKER! Party time for up to 20 people, includes: - everyone's games session - prosecco on arrival (softs and alternatives available) - another 2 drinks per person (anything off the menu!) - grazing boards & snacks - your own dedicated Game Guru to make recommendations, teach rules and keep the games flowing - request games to be reserved for the party in advance - 10% off retail for everyone on the day.